dvd2xbox - dvd2xbox is a DVD/CD-R to hdd copy program for the xbox which supports the formats UDF/ISO9660/ISO9660/VideoDVD/CDDA (Audio 2 Ogg ripping with freecddb naming, dvd ripping with libdvdread). It provides a simple all at once copy mode and a win commander style disc browser. dvd2xbox is a DVD/CD-R to hdd copy program for the xbox which supports the formats UDF/ISO9660/ISO96.. ::. dvd2xbox is a DVD/CD-R to hdd copy program for the xbox which supports the formats UDF/ISO9660/ISO9660/VideoDVD/CDDA (Audio 2 Ogg ripping with freecddb naming, dvd ripping with libdvdread). It provides a simple all at once copy mode and a win commander style disc browser. Game Backup Troubleshooting, Freezing? Dirty Disk Error? SmartXX v3 Color Changer Sample Released! dvd2xbox v0.7.0 by WiSo has been released!! Get back to nature and experience the primal thrill and the struggle of man versus fish in the most comprehensive, bass fishing simulation game available on the Xbox. 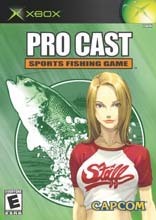 Pro Cast Sports Fishing recreates..